Kobra+2 CC2 is a personal cross cut shredder. It can also be categorized as an office shredder due to its intuitive features. It has a level-4 security rating, and it can shred paper, optical media (CDs/DVDs/Blu-rays), credit cards, paper clips, and staples. The Kobra+2 CC2 personal and office shredder has blades made up of hardened steel that can just as smoothly shred metal clips and staples saving significant time and effort of the user. The Kobra+2 CC2 cross cut shredder has 2 feed openings, one for paper, and the other for plastic. The shredded material is collected in different portions of the removable bin, with the paper, and plastic in separate portions. This ensures better waste management. The user may also view the capacity of the bin used, through the level indication window. The Kobra+2 CC2 cross cut paper shredder comes with an 'Energy Smart' system. This is a power system that automatically places the shredder in standby mode. This lowers your utility bills saving you money. The Kobra+2 CC2 personal and office shredder features 'Mobile Protection System' and uses dual electronic sensors to automatically shut down the shredder when the lid is raised. This feature protects the shredder from damages. Elcoman presents a Kobra +2, a professional shredder of the classic line. Kobra +2 shreds up to 27 sheets at a time. Credit cards, CDs, DVDs and films. Activates automatically at material intake. Shredding can be stopped and reversed just by touching the stop button and reverses automatically in case of jamming. Convenient and safe, 230 millimeter main throat. A sensor detects the bin removal, the lid opening and stops the cutting knives. Paper and plastic shreds are collected into two separate integrated bins. A 38.5 litre for paper and a 1.5 litre bin for plastics. The removable bin does not require plastic bags and it is equipped with a transparent front window to easily check the shreds level. 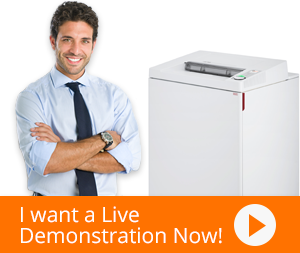 The energy smart energy saving system puts the shredder into power saving standby mode. Cutting knives are made of carbon hardened sealed unaffected by staples and metal clips. 24-hour continuous duty motor without duty cycle. Two separate sets of cutting knives, one for paper and one dedicated for CDs DVDs. Kobra +2 two shredding functions.